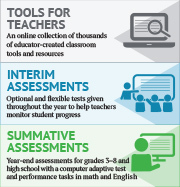 The Idaho Standards Achievement Test (ISAT) Comprehensive Assessment System consists of a Digital Library for Formative Assessment which provides resources for teachers to use to help improve student learning; Interim Assessments which are optional tests given during the school year to help monitor student progress; and the year-end Summative Assessment. Each of these are part of a coherent and comprehensive system of assessment designed to be used together to improve teaching and learning. Formative assessment is a process used by teachers that provides actionable feedback to adjust teaching and learning strategies for improving student self-assessment, reflection, and attainment of curricular learning goals. The Digital Library is a critical component of the Smarter Balanced system of assessment and provides formative instructional resources, tools, and professional learning opportunities for educators. The Digital Library Connections Playlists align classroom resources with Interim Assessment Block performance levels, thus tying together all components of the system. The Idaho State Leadership Team oversee state input on the Digital Library and provides training, support, and guidance to the State Network of Educators. The State Network of Educators provided feedback on the resources to be included in the Smarter Balanced Digital Library from all member states. They took part in professional development workshops on formative assessment and the Digital Library, and used an established Quality Criteria framework to submit and review resources. The Digital Library provides nearly 3000 instructional resources that are aligned to the standards, and can be integrated into daily classroom teaching. These tasks and activities are used formatively to gauge day to day understanding along a learning continuum. They contribute evidence that students are on a path to end of year mastery. Students are the intended beneficiaries of educational reform solutions. Yet rarely are they asked in meaningful ways about their perceptions of the effects of these solutions on their learning. Educators and policy makers are answerable to many stakeholders. This investigation centers on the primary group of stakeholders - students. The executive summary and following report summarize what was learned from interviewing Idaho students on the topic of assessment, and suggests ideas that have been generated regarding what might be done with this information at a local level, as a result of that communication. An Interim Assessment is an assessment generally administered 2-6 times per year outside of instruction to evaluate student knowledge and skills. The results of these assessments help educators understand student progress and form goals within the classroom to help students achieve academic success. The non-secure items and tasks in the ISAT Interim Assessment System are developed under the same conditions, protocols, and review procedures as those used in the ISAT Summative Assessment. They assess the same Idaho Standards, adhere to the same principles of universal design to be accessible to all students, and provide evidence to support claims in Mathematics and ELA. The application of evidence-centered design (ECD) helps ensure that each item or task clearly produces student responses that support the evidence statements and are aligned to the claims and standards. This linkage of items and tasks to claims through evidence statements underscores the strength of the chain that ties assessment results to the claims. Interim Comprehensive Assessments (ICA) use the same blueprint as the ISAT Summative Assessments. They assess the same wide range of standards, are administered with the same computer-adaptive process, include the same types of items and performance tasks, and report results on the same vertical scale. Interim Assessment Blocks (IABs) focus on smaller sets of standards in relation to the Comprehensive Interim and therefore provide more targeted information for instructional purposes. Teachers can combine multiple IAB assessments to provide more complete coverage of specific content and/or skills. The IABs will be administered with a computer-adaptive system as the item bank supports. Most items are scored by the Smarter Balanced test-delivery engine. The scoring of human-scored aspects of constructed-response items and performance tasks is a local or state responsibility. Both provide results that teachers and administrators can examine in relation to the Idaho Content Standards and then adjust instruction accordingly. The Smarter Balanced Digital Library offers guidance on how and when to use each type of assessment, how to evaluate students' responses, and how to interpret results. The full range of capabilities that are ultimately offered by the ISAT Interim Assessment System will depend on the ability to fully engage the computer-adaptive technology and ongoing enhancements of the system's technology. In the initial phase, schools and districts can use both the Interim Comprehensive Assessment and the Interim Assessment Blocks. Each year, students in grades 3-8 and once in high school take the Idaho Standards Achievement Test (ISAT) to determine whether they have achieved the standards for their grade level and subject area. There are tests for English Language Arts/Literacy and Mathematics. In grades 5 and 7, students also take the ISAT science assessment. These tests are administered to provide ongoing monitoring of individual, school, district, and state progress. Academic proficiency is more than scores. Competency in all academic areas is the goal for every child. This once a year (summative) test is an important component of the statewide student assessment system as stated in IDAPA 08.02.03.111.06. The ISAT items address a variety of skill levels, from short-term recall to skills and problem solving. The ISAT summative assessment is administered during the last 8 weeks of the school. It consists of two parts: a computer-adaptive test and performance tasks that are given on the computer. Contact your District Test Coordinator, if you need an account to access the portals. When your school district provides you with your student’s score report for the 2018 ISAT, you may have questions about what the scores mean, how they are used, and where you can find relevant educational resources. Each school district will provide the score report within three weeks of obtaining all scores for their district. Parents and families throughout Idaho may receive this information at slightly different times. For additional information, please refer to the Resource Tabs below. For more information on Score Reports, please view the FAQs and Links tabs. You can view the 2016 ISAT results, alongside data for prior years, in the Idaho State Report Card. What does the score report tell me about my student’s level of understanding? This report shows how your student is performing overall on the Idaho Content Standards for ELA/Literacy and Mathematics and their performance in the categories that lead to these scores. The scores are only one aspect of a student’s academic performance, but serves as an important measure of progress. How do these scores affect my student? Your student’s scores on the 2016 ISAT in ELA/Literacy and Mathematics do not affect his or her report card or ability to move on to the next grade level. We primarily use these scores to help families, schools, districts, and the state understand and improve student academic achievement in Idaho. What grade levels participate in the ISAT ELA/Literacy and Mathematics? Students in grades 3-8 and 10 participate in the ELA/Literacy and Mathematics assessments. The assessments were also made available for grades 9 and 11. What is the overall range for the student scale scores? The scale scores for all grades fall between 2000 and 3000. However, there is a specific scale range for each grade and content area. This range is shown on the overall performance graphic on the student report. Scale scores are also separated into four achievement levels. Achievement Levels 4 and 3 indicate Advanced and Proficient. Achievement Levels 2 and 1 indicate Basic and Below Basic. For more information on scale scores and achievement levels, visit the Smarter Balanced Scores web page. How does the ISAT ELA/Literacy and Mathematics measure my student’s level of understanding? A variety of item types, from selected response to performance tasks, are used to assess student knowledge, skills, and application. The test uses a computer adaptive framework which is a significant improvement over traditional fixed form assessments. For example, the computer program adjusts the difficulty of questions throughout the assessment based on student responses. So a student who answers questions correctly receives more challenging questions, while an incorrect answer generates an easier question. This system quickly identifies which skills students have mastered. Computer adaptive tests like the ISAT in ELA/Literacy and Mathematics are typically shorter than fixed form assessments because fewer questions are required to determine each student’s achievement level. In addition, accommodations for students with disabilities and English language are built into the system so that the progress of students is accurately measured.